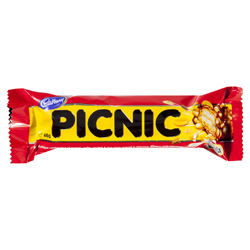 Cadbury Picnic is a chocolate covered wafer with toffee, peanuts, and puffed rice. This surely is one of the ugliest chocolate bars available - but who cares when it tastes so good? Sugar, Peanuts, Wheat Glucose Syrup, Milk Solids, Sweetened Condensed Milk (Milk, Sugar), Palm Fat, Cocoa Butter, Cocoa Mass, Wheat Flour, Rice Crisps, Corn Starch, Emulsifiers (Soy Lecithin, E471, E476, Sunflower Lecithin), Salt, Palm Oil, Flavours, Raising Agent. (E500). Milk Chocolate contains Cocoa Solids 27%, Milk Solids 26%. Contains Milk Chocolate 40%, Caramel 23%, Peanuts 23%, Wafer 4%, Rice Crisps 2.5%.